Asra Nox is the leader of the Occasus Cult, and is utterly dedicated to wiping all non-human life from the universe, and any humans who would dare get in the way of that goal. Orphaned as a child by a band of alien brigands, she was found by Esther Bright of the Terrene Protectorate. Esther brought her into the Protectorate's care, and over time Asra became the former Protector's personal protegé. She was a brilliant and driven student, but the scars of her childhood ran deep and dark. When Esther's research uncovered evidence of The Ruin, a force of pure destruction from time forgotten, she turned to Asra in hopes that she would be able to help find a way to prevent the beast from escaping its prison. But Asra instead saw this as her chance to finally "cleanse" the universe of all she considered "lesser" races, leaving only humanity. Nothing Esther said could sway her, and the angered woman left, eventually forming the Occasus Cult with other humans who shared her mad dreams of intergalactic genocide. Asra in fact holds a dim view of most of those the cult, largely considering them dullards and ultimately disposable. But as she rationalizes, "better an army of morons than no army at all." And the army of the Occasus is hundreds, if not thousands strong, and nothing if not driven. 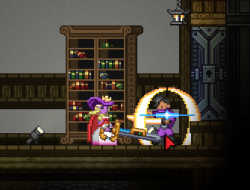 The player first encounters Asra as the boss of the Grand Pagoda Library, as she and her thugs search for the Hylotl Artifact. 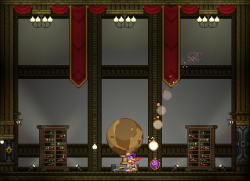 She is found in a large room in the Library's lowest and most decrepit level, with two bookcases in the background that provide platforms for both the player and Asra to use. Asra is protected by an invincible energy shield through most of the fight, forcing the player to dodge her attacks and wait for an opening. Asra cycles through her attacks in a pre-set pattern, making it fairly easy to counter her moves once you know what she's going to do. 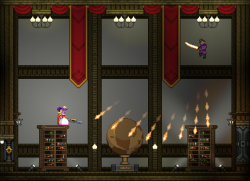 Ideally the player should have a weapon with high DPS (damage per second) to take advantage of the short window of opportunity presented; melee weapons with secondary attacks like "Blade Whirl" or "Flurry" are highly effective, and explosives-hurlers like Rocket Launchers can also take large chunks out of her life bar quickly. Her recovery period is based on time, not damage taken, so the more damage you can do in that time the better. Asra leaps high into the air and unleashes a wide spray of energy daggers at the ground, which explode a few short moments after impact. While the initial attack leaves safe spots on the floor in either corner of the room, the following explosions do not. The safest places to be during this attack are on top of the bookcase opposite her, or on either wall using the Spike Sphere Tech. If you go the bookcase route, be sure to drop down quickly as she may teleport on top of you for her next move. Asra teleports to the top of one of the bookcases then dashes to the other side of the room, damaging players who got caught up in her passing. She quickly follows this up by teleporting to a corner and slash-dashing to the opposite corner at ground level. Evade the first attack by sticking to the floor, then a simple leap avoids the second slash... or use the Spike Sphere to stick to a high wall and avoid both with ease. Once Solus Dash finishes, Asra will stay on the ground of the room for a moment. If you approach her, she will swing the katana horizontally. If you won't approach her, she will proceed to the next stage. Getting slashed results in Asra blinking to a random part of the room and the sequence happening again. Also happens once Energy Beam finishes. Asra transforms into a floating Distortion Sphere, then screams through the air at you in a fast arc, targeting you anywhere in the room, even walls and ceilings! This can be avoided using your own Distortion Sphere, rolling forwards and backwards and keeping her off-target. 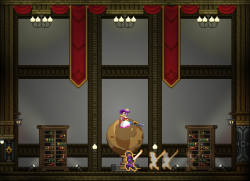 If you don't have a Distortion Sphere (the Spike Sphere is too slow), simply run from one side of the room to the other. When you get close to the wall, start running back immediately when Asra hits the floor. This is easily her most damaging move and you may end up taking several hits before getting the timing down, so have healing items ready to use. After eight Sphere-slams, Asra runs out of energy and must recover, dropping her shield and catching her breath for a few seconds. This is the only time she is vulnerable, so get in fast and use your strongest attacks as quickly as possible before her shield recovers. Following her recovery from the Homing Sphere, Asra teleports to a lower corner of the room. Quickly jump on top of either bookcase to avoid the deadly beam of energy she unleashes from her blade, which persists for several seconds. Use this time to heal up if you need it. After this attack, she will return to the beginning of her attack cycle. Once she is beaten, Asra will swear revenge and retreat without the Artifact. Asra herself will not fight directly in the battle of The Baron's Keep, instead simply watch from her perch the back of the gigantic Bone Dragon. When the fake drake is finally crushed, Asra beats another retreat, leaving any remaining Cultists to their fate. Somehow, Asra makes it to the core chamber of The Ruin before the player, and engages them in another duel, using mostly the same tactics as before, including her invincible energy shield. However, Asra is no stronger than in the first encounter, and in fact her movelist and patterns are altered to make this fight a lot quicker. Asra teleports to one side of the room then slash-dashes to the other side, damaging players who got caught up in her passing. This time though she only dashes once at floor level, dodged with a simple leap or by sticking to the wall. Asra transforms into a floating Distortion Sphere, then screams through the air at the player in a fast arc, targeting them wherever in the room they are! This is fairly easy to avoid using your own Distortion Sphere, rolling forwards and backwards and keeping her off-target. 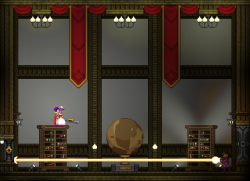 If you don't have a Distortion Sphere (the Spike Sphere is too slow), simply run from one side of the room to the other. When you get close to the wall, start running back immediately when Asra hits the floor. This is easily her most damaging move and you may have to eat a few hits, so have healing items ready to use. After eight Sphere-slams, Asra runs out of energy and must recover, dropping her shield and catching her breath for a few seconds. This is the only time she is vulnerable, and by this point the player should have heavy weaponry to carve off a large percentage of her health before she can raise her shield again. Following her defeat, Asra once again runs away, leaving the player to deal with Heart of The Ruin. Unlike the Grand Pagoda Libra fight, this time Asra will not drop any prizes. This page was last modified on 24 July 2018, at 23:02.